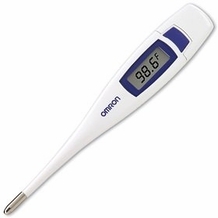 3 times faster than traditional digital thermometers. Features include jumbo display for easy reading, memory and long-life 3-volt battery. For use in oral, underarm and rectal locations.